Number of people trained - Over 5,743 and growing! ​Register for an upcoming training. The Rotary Club of Plymouth has partnered with Allina Hospitals and Clinics to begin a new signature project called Heart Safe Plymouth. 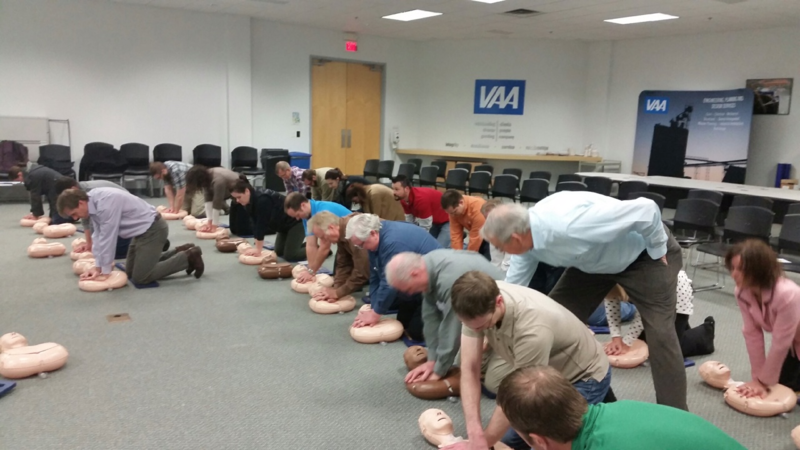 Educate and train on the emergency treatment of Sudden Cardiac Arrest (SCA) by providing CPR and automated external defibrillator (AED) training to individuals and organizations in the community. 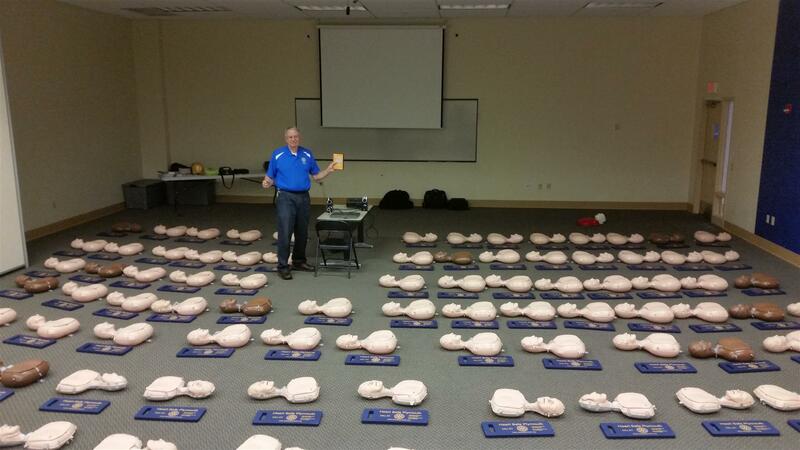 Encourage and assist with the acquisition of AED’s so our community has more of them readily available if needed. 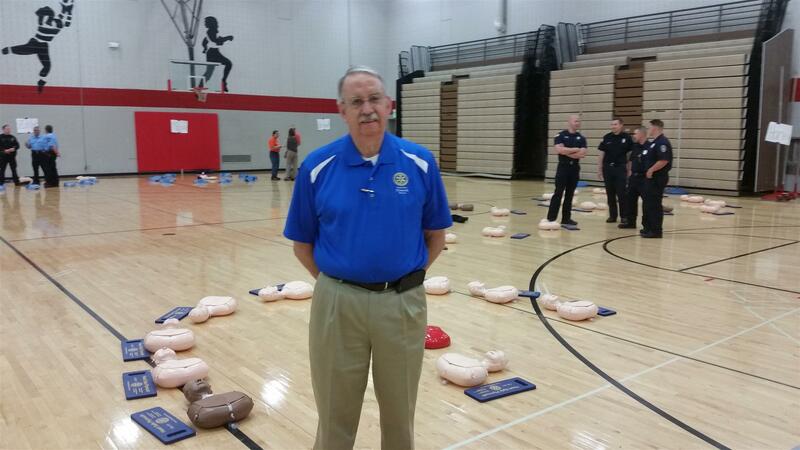 Get AED’s in the community listed on the National AED Registry so their location is available to 911 operators. 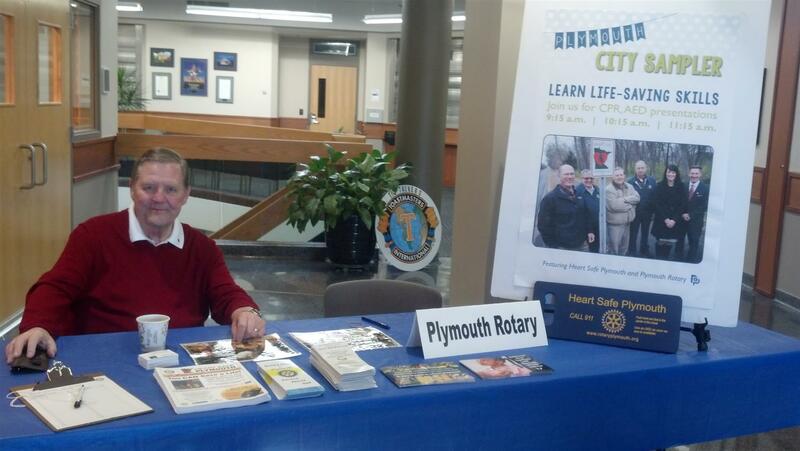 We, The Rotary Club of Plymouth, have reached our initial goal. We were awarded so many “heartbeats” for working on the above items. 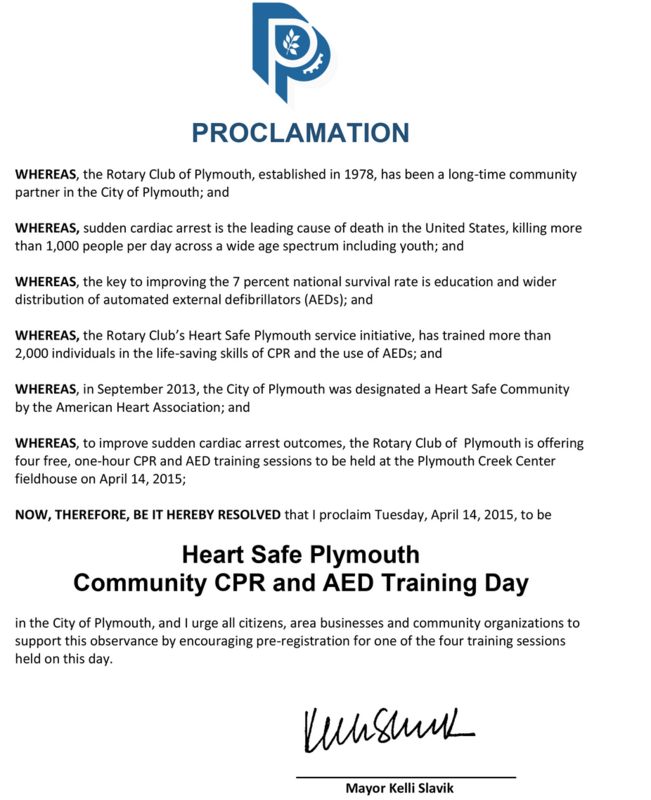 Based on the program Allina has developed and our population in the City of Plymouth, we obtained 750 heartbeats to earn the title of “Heart Safe Plymouth”. 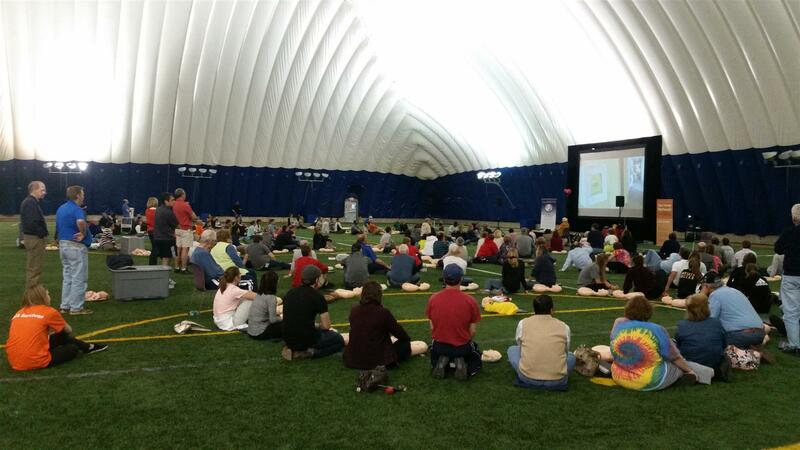 We are on our way and have trained more than 5,743 people, and are looking for more organizations that would like to be trained on CPR or assist with the procurement and placement of AED’s in our community. Also known as sudden cardiac arrest or SCA. Cardiac arrest is the cessation of normal circulation of the blood due to failure of the heart to contract effectively. A cardiac arrest is different from (but may be caused by) a heart attack, where blood flow to the muscle of the heart is impaired. Cardiac arrest is a medical emergency that, in certain situations, is potentially reversible if treated early. The treatment for cardiac arrest is cardiopulmonary resuscitation (CPR) to provide circulatory support, followed by defibrillation if a shockable rhythm is present. An automated external defibrillator is a portable electronic device that automatically diagnoses the potentially life threatening cardiac arrhythmias of ventricular fibrillation and ventricular tachycardia in a patient, and is able to treat them through defibrillation, the application of electrical therapy which stops the arrhythmia, allowing the heart to reestablish an effective rhythm. What age group can take the training? 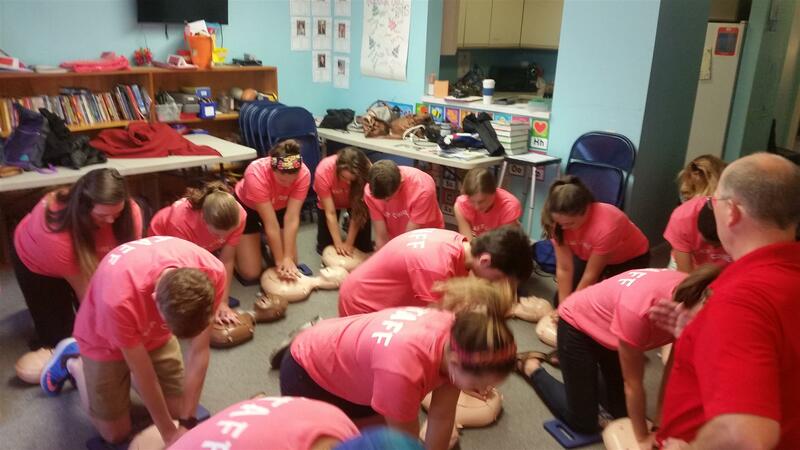 --Anyone who is old enough to handle CPR training, but teenagers and up is a great place to start. --The time to train and offer certification is one (1) hour. When can training be offered? --Training can be done during the business day, nights and weekends. How many can be trained at one time? --We can train up to 60 people in one session. However, this requires that you have ample space available for 60 people with dummies and trainers to perform the work. If not, many organizations will offer back-to-back sessions with a smaller size of 10-20. Can you give examples of people who receive training in Plymouth? 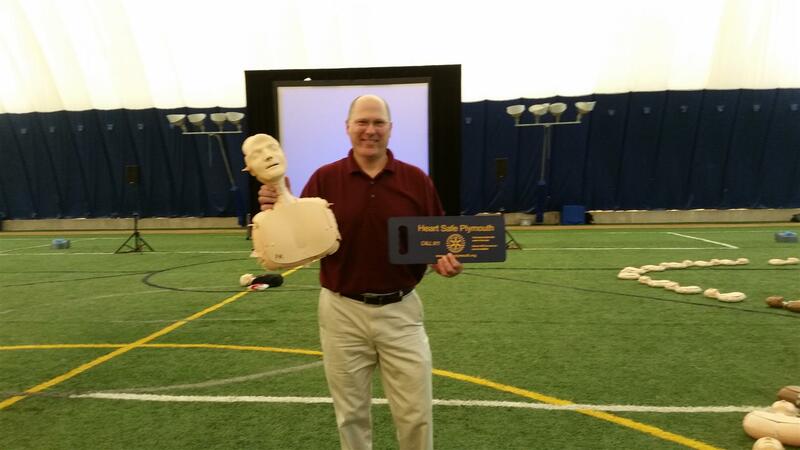 --Anyone interested in learning how to save lives. Some examples are businesses for profit, business not for profit, stores, schools, restaurants, sporting teams with coaches and parents, etc.